The shady start of the drive. Streams wind in and through the forest. Lush growth lines the road. But you have to look for them. The road twists through many cruves. 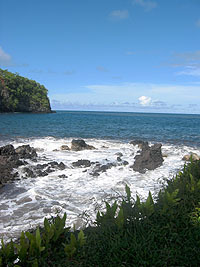 Onomea Bay and the Collapsed Sea Arch. The shady start of the Donkey Trail. The Donkey Trail ends at a very photographic point. Water pours from the swimming hole. 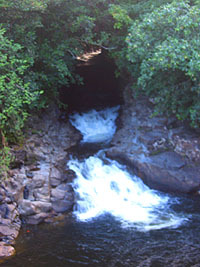 A closeup of the hole and swimming area behind. This 4 mile scenic drive on the Hāmākua Coast is a must do drive... we don't care if your here for less than an hour, you do this drive, ok? We personally take this drive at least once a month - just for the sheer beauty that exist in these four short miles. 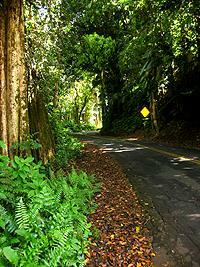 The road twists and snakes through a lush tropical rain forest lined with streams. 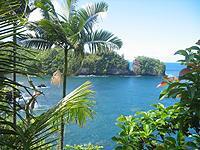 Several stops allow for breathtaking views of the ocean, coast, and the collapsed Onomea Arch. The Hawai'i Tropical Botanical Garden can be found about halfway and a nearby interesting and short hike down the old donkey trail to the ocean provides you with stunning photographic and scenic opportunities. While this road is a regular, paved road, it is a bit narrow. The road also twists and snakes around tight curves and there are several one-lane bridges. In some places the road, on one side, is a high natural rock wall with no shoulder. 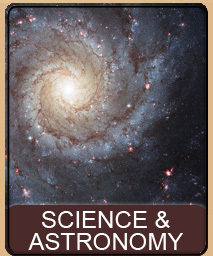 This means that room is tight on the road especially on curves. Do NOT speed on this road. The curves are tight and if you stray into the oncoming lane there is no room for them to get over. Likewise for you -- if the oncoming car is speeding they will probably stray around the curves, be alert and drive extra slow so you have more time to react. Locals know that this road is scenic and thus expected to be slow. Any local on this road is here for the view too. Nobody is in a hurry - except tourists (go figure). It is preferable to take this drive from the Hilo direction - if you do so you avoid having the rock wall and no shoulder on your side. This is also the most preferable direction to drive for easy access to pullovers for photographs and scenic views. Most of the views on this drive are makai (towards the ocean), which would be on your right if you came from the Hilo direction. This is not a road to do if it is raining. You should do this road on a bright sunny day. Any time of day is fine though we personally prefer the morning because the additional sunlight helps penetrate some of the darker areas for better photos. 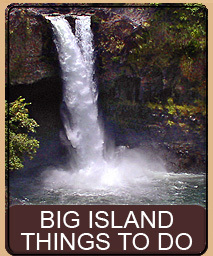 To get to the start of this scenic drive, take Highway 19 out of Hilo and North up the Hāmākua Coast. Highway 19 can be accessed from Hilo Bay Front by going over the metal bridge that spans the Wailuku River. You will follow this road to about the 7.5 mile marker at that point you will see a well marked right hand turn for the Scenic Drive. Once you make the right hand turn, you are on the scenic drive. You will follow this until it takes you, in 4 miles, back to highway 19. Unlike our other Scenic Drives, we are not going to do this drive by the odometer. 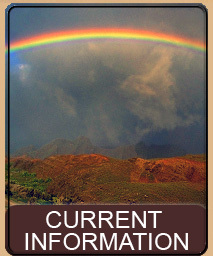 Instead, we will describe what you will be seeing along the way but leave it to you to enjoy how this drive unfolds. We start this drive in the little town of Onomea, the name of which means the best place. This side of town does not have much... houses, a church or two and a few stores including one which sells nice koa wood crafts and other local items. After you leave the little gift shop that sits next to the road on the right hand side you will see, ahead of you, that the foliage is getting thicker - this where you need to begin to take it easy and slow down as the road narrows and becomes curvier. As you drive the road here you will be in and among a wide variety of trees. 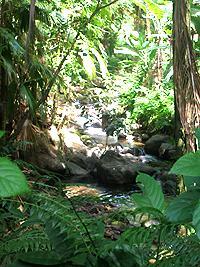 The area is extremely lush, receiving an average of 138 inches of rain a year. 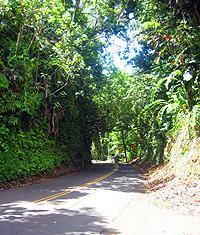 The road itself is lined with Mangos, Alexandra Palms, Red African Tulip Trees, Banana and more. 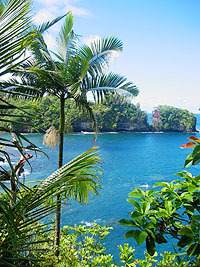 The Alexandra Palms were planted between 1912 and 1922 by the then Superintendent of Public Parks for the Big Island, Manuel Tavares, who is also responsible for many other plantings around the Big Island. 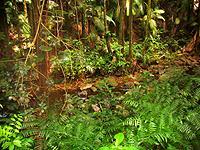 The other plants come from the variety of villages, farms and settlements that have been in this area over the ages. On the ocean side of the road, if you go slowly enough with your windows down, you can hear waterfalls and see streams - these are lush and very beautiful areas. On the opposite side of the road, the cliff itself harbors much life for most of the cliff side. From simple mosses to Guava, ferns and other trees and brush. Unfortunately, you can also find the dreaded Miconia plant growing here, a plant that should be destroyed at every opportunity. It is simply stunningly beautiful. Cool crisp smells and dampness filled with exotic scents... the sound of the water, from the very many streams with their tiny waterfalls. Sunlight barely makes it through the trees here and everything is bathed in a dimmed and hushed blanket of hues and tones. Around each tight curve is another smell, another view, another stream - though you have to hunt carefully for the streams as they are well hidden and wind through and among the trees in the valleys below you. As you continue on this road, you will also encounter a couple of single lane bridges. Some of these have very small pullouts just before, or just after the bridge and narrow trails leading down to the streams, offering the ability to relax or explore. Do be careful on the one lane bridges though, as some of them are on tight curves with poor visibility. The best approach is to come to a nearly full stop, well before the bridge, and inch forward - craning your neck to see if there is any oncoming traffic (we rarely use horns in Hawai'i). Of course you do have your lights on, right? Curve... bridge... curve... bridge... ohhh, less plants and suddenly an ocean view. Here there is a pullout and you will undoubtly encounter other people parked at this spot. Cram your car into the fray and get out. 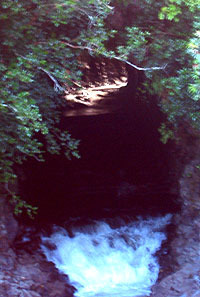 This is the Onomea Arch. This particular view of the bay shows a long stretch of land with what used to be a huge sea arch. You can easily see the huge gap in the hill across the bay and the rubble at the bottom of the gap. This sea arch, which Hawaiian Legend says was created by King Kamehameha by throwing a spear, has probably stood for thousands of years until an earthquake on May 24, 1956 caused the top of the arch to collapse. Regardless, this famous natural formation, created by the heavy erosion this area receives, is still an extremely popular attraction and a beautiful photographic experience. You may also notice a steeply descending narrow road off the side here. 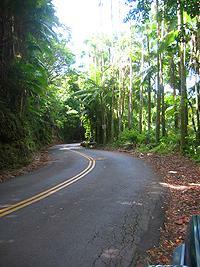 This is an access road for the Hawai'i Tropical Botanical Gardens as well as a public access trail. While it is not possible to drive down this gated road you can walk down it. At the base there is a gate that leads to the Gardens, which you can't pass. However, making a right at this point takes you down to a public access, very small inlet and beach. This is a nice spot but we personally avoid this walk as we prefer a much more slippery but enjoyable Onomea Bay Donkey Trail Hike that is just a bit further the road. As you approach the Gardens, on the left you will see the Visitors Center and the Parking Area. If you intend do stop and visit the Garden park in this area (please do not park here if you are taking the Donkey Trail Hike described below, unless you intend to also enjoy the Garden). The actual garden itself takes 25 acres of the valley, though over 40 acres belong to the organization. Originally developed by Dan and Pauline Lutkenhouse, amidst much controversy, in 1978, it opened to the public in 1984. Today the Garden features over 2000 species of plants and a number of trails including the Palm Jungle Trail, the Heliconia Trail, the Oceanfront Trail, Alakahi Stream Trail, Boulder Creek Trail, Cook Pine Trail, and the Lily Lake Trail. You can also find Ginger, Orchid, Bromeliad and Banyan gardens as well as bird aviaries, a small marine preserve, a flamingo and duck pond and of course, spectacular views of Onomea Falls. 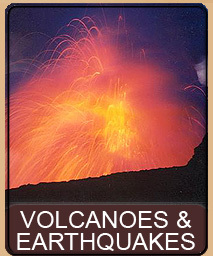 The gardens can be contacted by calling 808-964-5233 or visit their web page at http://www.htbg.com for more information. There is a fee charged for visiting the garden. 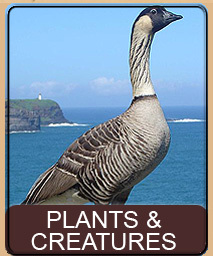 If you are not terribly interested in the offerings of the Botanical Garden, or wish to save money, you can easily enjoy the spectacular view of Onomea Bay, as seen from the Garden, by taking the Donkey Trail Hike. As you pass the Garden, on the left is the visitors' center and on the right is the garden itself with a fence going around it. Pass the garden and at the end of the fence, on the right side of the road, you will see a small sign and a trail leading downwards. This is the old Donkey Trail to the ocean. 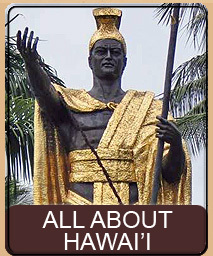 Prior to railroads coming to the island, Onomea Bay was a major port for bringing goods into Hawai'i as well as taking the precious sugar cane out of Hawai'i. This trail was used to ferry the goods from the boats by donkey. This is a short, 600 foot hike down to the ocean and goes next to the Onomea Stream. The view from the base is simply spectacular and extremely photogenic. This is one of our favorite places to go and simply relax for a bit, soaking up the beauty that makes Hawai'i so special. We have a complete review of this trail. 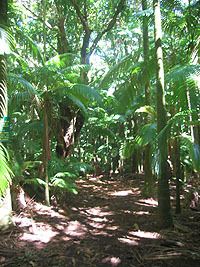 Click here for the Onomea Bay Donkey Trail Hike Full Details. Continuing down the scenic drive you will leave some of the tree cover for a bit and come out into more open land, some of which is under development. After a short distance you will, however, again be under the lush tree cover and back to the twisting roads. After a short bit you will come to another bridge over a river. As you slowly cross the bridge, look to your left and back and you will see a large hole in the cliff side spilling water into the river. Just past the bridge are a couple of small pullovers. 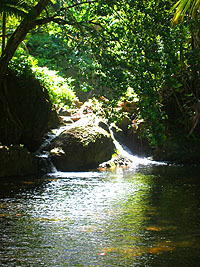 There are a number of small trails here which lead to the river and this spot is somewhat popular for swimming and relaxing. If the water coming from the hole is not too forceful it is possible to carefully walk through the hole to the other side and into a delightful swimming hole. Do not, however, attempt this if the force of the water coming through the hole is any great quantity as the currents will be too strong for you to withstand. Even if you don't swim or visit the swimming hole, this is still a very pretty and relaxing spot with photographic opportunities. Note that we are fairly sure that the swimming hole is on private property and that by going there you may be trespasing. Though there are no posted signs that we can see, please respect the area and if asked to leave, please do so. This scenic drive takes you off highway 19 and then back on, about 4 miles further down the coast. Simply turn in whatever direction you want on the highway and continue on. This page is named 'Drives.onomea'. Can't Find It?